Being one of the newest hotels in downtown we are poised for business travelers, convention attendees and those looking for their big break while visiting Music City. Located in SoBro, this hotel will feature 255 rooms, 24 hour food options including onsite parking. World of Hyatt members can enjoy our complimentary breakfast when they book an eligible rate. Our breakfast includes premium ingredients, cage-free eggs, and regional chef-inspired dishes. PET POLICY: 1-6 NIGHTS A 75 NON-REFUNDABLE FEE. 7-30 NIGHTS A 75 NON-REFUNDABLE FEE PLUS AN ADDITIONAL 100 CLEANING FEE. MAXIMUM OF 2 DOGS PER ROOM ARE PERMITTED. WEIGHT MUST BE 50 LBS OR LESS MAX OF 75LBS PER RM. FEES ARE IN USD. Parking: Self parking - 29USD per night plus tax, Valet - 32USD per night plus tax. 26APR19-27APR19 Rock n Roll Nashville Marathon - Cancel 14 days prior to arrival, 1 nt deposit due at booking. Nonrefundable within 14 days of arrival. 05JUN19-09JUN19 CMA Fest - Cxl 30 days prior to arrival. 1 nt deposit due at booking. Nonrefundable within 30 days of arrival. 11MAY20-14MAY20 SEC Basketball - 1 nt deposit at booking, full prepay 7 days prior to arrival. Bakery Cafe: Variety of freshly prepared, cafe quality items, including made-to-order entrees, sandwiches, soups, salads and pizza which guests can order 24 hours a day, seven days a week. Wildhorse Saloon: Barbeque and Southern food. 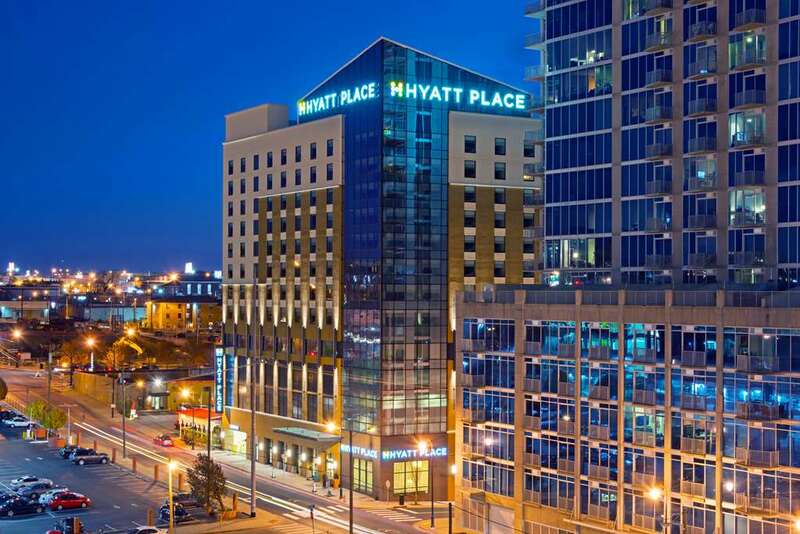 This 13-story hotel features 255 suites in the SoBro area of downtown Nashville, TN. The hotel has self and valet parking on site. Hotel is walking distance to Nashvilles famous Honky Tonk Row and the Music City Center Convention Center is just two blocks away. Nashville International Airport is 15 minutes 7.7 miles away.